Each meetgreen audio conference prevents additional CO2 pollution of the environment and by choosing to use the donation number you can make another step for environmental mindfulness and protection. For your next meetgreen conference, consider dialing in with 01805 – 53 53 53¹ and support our ecological project in Germany – every conference participant can choose to use this number and join our efforts. Everybody can become a supporter of environmental mindfulness. Feel free to recommend meetgreen and our EcoProject. In 2018 meetgreen will support the STADTBAUMKAMPAGNE BERLIN and carry the costs of the planting and care of urban trees in various districts of Berlin. 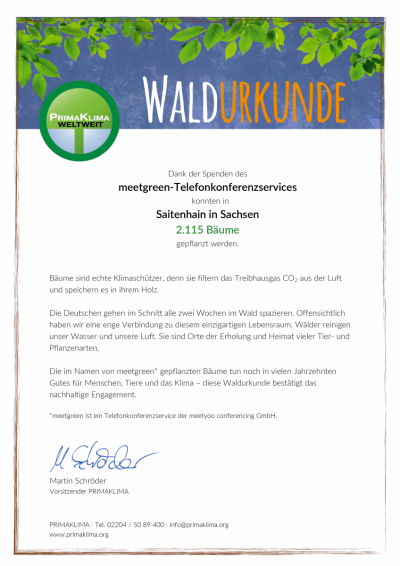 With the help of our meetgreen user we have already been able to sponsor 12 trees during the “spring planting season” of 2018. With each conference that is led by customers using the donation dial-in 01805 – 53 53 53¹, we are one step closer to our goal of planting even more trees in the autumn of 2018. In 2017 we were able to use the donation profits from over 130,000 audio conferences towards our EcoProject and plant 2,115 trees which will help compensate for the steadily rising level of environmental pollution. This means that with each audio conference using the donation dial-in 01805 – 53 53 53¹ you are compensating for roughly 0.20 kg CO2*. Trees enhance our quality of life and are vital for humans and animals alike. They remove dust and other contaminating particles from the air, provide us with oxygen to breathe, provide a habitat for many animals, and make our world more beautiful. The meetgreen forest is located in the municipality of Wechselburg and contains a multitude of tree species such as common oak, wych elm, littleleaf lime, bird cherry, common hornbeam, harewood, and red alder. Apart from protecting the environment by preventing additional CO2 pollution, this project has improved soil development and promoted biotope growth in a region that is characterized by coniferous woods. The introduction of hardwood improves the scenery and helps balance the distribution of wood types. *a beech binds approximately 12.5 kg of CO2 over the duration of a year. In 2017 meetgreen partnered with PRIMAKLIMA and planted 2.115 saplings in Germany. PRIMAKLIMA is a non-profit organization that has been fighting for the preservation and development of forests, thus actively engaging in climate protection. Trees are invaluable – they represent an integral part of the ecosystem and are needed for a stable climate. Because of the rising rate of CO2 emissions, reforestation is becoming a central topic of international climate politics. PRIMAKLIMA has been able to successfully realize numerous reforestation projects all over the globe and is currently an active ambassador for sustainability on four continents. Would you like to become a meetgreen EcoPartner? We are always happy to receive ideas and suggestions regarding additional EcoProjects in Germany which are in need of support.